9 hotels in Whitby with parking for you to consider. Whitby may not be the biggest coastal town in the UK but it certainly boasts an impressive number of hotels and B&B’s, in fact over 200 at the last count. However many of the hotels and bed and breakfasts in central Whitby struggle with parking, as the town has limited parking available on the busy streets. These nine Whitby hotels with parking represent the range of establishments available in Whitby and the surrounding areas. These particular Whitby hotels were chosen firstly because they have off road parking, secondly because of the amenities offered and thirdly for the excellent reviews they have received from past guests. The Wheeldale Hotel boasts an enviable position on North Promenade Whitby’s West Cliff. Peter Coleman and his team pride themselves on delivering a fantastic four star experience for all guests staying at The Wheeldale. Breakfast is a treat to look forward to, lovingly prepared by in house chef, Toby, from locally sourced ingredients. A feast to start your day exploring Whitby. Hotels in Whitby with parking are few and far between, but The Wheeldale has it covered – with easy off road parking for up to eight cars. If you’re curious about the weather in Whitby or fancy a peep at the West Cliff, why not take a look at the Whitby Web Cam courtesy of The Wheeldale Hotel? Please mention The Whitby Guide when contacting the hotel directly. 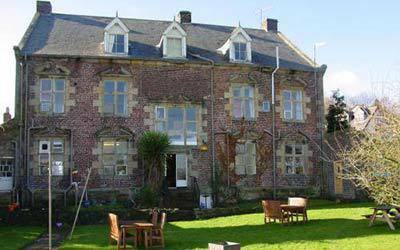 The next property in our comprehensive list of Hotels in Whitby With Parking is The Seacliffe. The Seacliffe is something of a rarity in Whitby because it has off road parking, a fully licensed bar and its own restaurant. This trio of facilities makes The Seacliffe a great choice for those seeking a laid-back stay in a traditional Whitby hotel with sea views and expansive views of the stunning North Yorkshire Coast. This fantastic hotel has 17 en-suite double rooms which have all been recently refurbished to a high standard. The Seacliffe also boasts its very own fully licensed bar; the perfect place to unwind after a long day out exploring the best of Whitby. If you don’t fancy one the great restaurants in Whitby town, then the restaurant at The Seacliffe offers an extensive menu; there is something to suit every taste; dishes from around the world such as Surf & Turf and Seafood Mornay to local delicacies including Sausage & Mash and Whitby scampi. The car park has eight spaces available for guests so when the hotel is at full occupancy there’s every likelihood that some guests will have to use the free parking zones dotted along North Promenade just in front of the hotel, for which scratch cards are available. The Saxonville Hotel in Whitby has been a family run institution since 1946. Located on Ladysmith Avenue on the West Cliff, The Saxonville Hotel is a great pace to stay for your Whitby break. The Saxonville Hotel has a bar and restaurant and is one of the most established hotels in the town centre. The Saxonville Hotel is one of the few hotels in Whitby with parking found near to the town centre. The car park at The Saxonville Hotel is secure and off road – to access the car park you must request the key from reception and is strictly for use by residents of the hotel. The car park operates on a first come, first sere basis, so be sure to arrive early to avoid disappointment. The White House Inn; a Whitby hotel with parking that’s actually a pub and restaurant with rooms! Strictly speaking this is not a hotel, but since hotels in Whitby with parking are scarce, we thought we’d bend the rules to include this fantastic pub with rooms. The great thing about this place it that there is a car park which is what we’re aiming for in tis here article but the further benefits of this pace are that there is a fabulous on site restaurant (and a bar, obviously, being a pub) so there’s two of the key ingredients that make a hotel, well, a hotel. The icing on the cake at this splendid Whitby pub with rooms and restaurant is this – the views of Whitby bay are breathtaking. A stay at the White House Inn may mean that you’re not technically staying at a hotel in Whitby with parking, but it does mean that you’re staying in a fantastic location, with as much food and drink as you cold shake a stick at and there’s a superb view and ample parking, so in our view this has to be included in this round up of hotels in Whitby with parking. Enjoy! With only 7 guest rooms Elford House is the smallest of our chosen hotels. This doesn’t mean you feel cramped and uncomfortable when staying though. On the contrary, the rooms are very spacious, beautifully decorated and fully equipped with all the normal bedroom amenities. Located just 5 minutes’ walk from Whitby town centre, the harbour and the beach, this family run hotel offers a welcoming atmosphere with a few added touches that you rarely see elsewhere (your freshly prepared continental breakfast is delivered to your room at a time to suit you, meaning you can make the most of your holiday lie in). Wifi is free and the car parking spaces are literally outside the front door, so no getting wet on a rainy day. The only downside to the hotel is that it doesn’t cater for children, but if you’re looking for a romantic getaway then this will probably be a bonus. Located within the village of Ruswarp and within its own extensive grounds, this Jacobean hall has been beautifully renovated to retain many of the period features whilst adding all the creature comforts you need for a memorable stay. What’s more, the hotel is just 1.5 miles from Whitby town and all the attractions you’ll find there. Technically speaking, Ruswarp Hall isn’t a hotel as it doesn’t offer dining. It is however one of the top rated places to stay in Whitby so we thought it should definitely be mentioned here. It has 13 well equipped rooms, including a family room, but it should be mentioned that the hotel doesn’t accept children under the age of 7 years. Walks around the extensive grounds are popular with guests however for those of you who want a more active holiday you can always book for fishing, boating, hiking tours, horse riding or golf while staying. And then of course Whitby and its plethora of shops is just a mile or so away. This newly built hotel is part of the ‘Marston’s Inns’ brand and is very popular with business and leisure guests. Located just a few miles to the south of Whitby, it’s a great choice for families as they have several large family bedrooms, a big outdoor playground and a terrace made for running around on. The rooms are, as you would expect in a new build, pretty standard but they are very clean and tidy and well equipped. With there only being 28 rooms though they do book up very quickly so you might want to book early to avoid disappointment. There are plenty of hiking trails and other outdoor activities around the hotel area, and if you do decide to walk to Whitby town it’s only just over a mile away. Penny Hedge is the perfect place to stay if you’re looking for a modern getaway but if you’re looking for a bit more character then you might want to try elsewhere. Although not technically in Whitby, the Raven Hall Hotel offers everything you’ll need from your Yorkshire stay at a very reasonable price. Situated in Ravenscar approximately 6 miles south of Whitby, Raven Hall Hotel sits proudly on top of a cliff overlooking Robin Hood’s Bay. Its stunning location provides fantastic views of both the North Sea and the North York Moors, making it a beautiful place to stay. More than just your average hotel, this one offers both indoor and outdoor leisure facilities that are free for guests (swimming pool and sauna, tennis courts, croquet lawns etc). It also provides free Wifi, private parking, a range of hiking trails that span the 90 acre grounds and its own 9-hole golf course. Now, you might be thinking that the Raven Hall Hotel is an exclusive hotel for the older generation but surprisingly it’s actually very family orientated. Children of all ages, and indeed your pets, are made very welcome with several of the 52 bedrooms being suitable for families. So, it’s an ideal place to stay whether you’re looking for a quiet getaway, an activity holiday or a family break. A five minute drive up the coastal road from Whitby you’ll find Raithwaite Estate, a luxury hotel perfect for a special occasion. The hotel shouts opulence from start to finish so be sure to put in a couple of posh frocks when you do your packing! With its large indoor pool, sauna, spa and fully equipped gym you can really work up an appetite before sampling the food in one of the two restaurants and enjoying a cold pint in the bar. The bedrooms are complete luxury with several having balconies and terraces, all having en-suite facilities and all offering a heap of amenities which you may or may not need. Again, you may thing that this top notch hotel would frown upon children but they are made to feel more than welcome, as are your pets. Several of the 73 bedrooms cater for families and pets, and there are elevators available throughout the hotel to help with getting around. Of course, parking is private and free of charge with a porter service available on request. We love the Morningside Hotel. Proprietors, Paul and Sandra pride themselves on high standards of service, comfort and cleanliness. This excellent hotel has everything that you would expect of a quality establishment. There’s a well stocked bar for those early evening refreshments, there’s an in-house restaurant providing each of the three meals f the day; breakfast, lunch and dinner; the chef has worked in many award winning restaurants and takes great pride in serving the finest fresh local produce according to the season. The lounge at Morningside Hotel is arranged with a wide selection of chairs and sofas to taketh most of an uninterrupted view of the Sort Sea straight out if the front window. Sit in comfort with a glass of your favourite tipple and observe the changing tide as the waves crash onto Whitby beach. Morningside Hotel is another of the few hotels in Whitby with parking. There is space for around 10 cars in the car park so there’s plenty of space to go round for those wishing to park off road in the forecourt to the front of the hotel. So there you have it…a snap shot of hotels in Whitby with parking facilities. Of course there are plenty of other hotels to choose from so you may want to visit Booking.com to view a wider selection of Whitby accommodation. Love Hotels with Parking? Pin It!